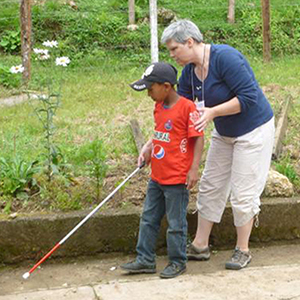 White canes are given to people who visit our eyeglass clinics whose vision is so poor they cannot be helped through the provision of corrective lenses. Your gift of $15 will allow for greater mobility and independence. The white cane has proved to be a useful tool for millions of blind people in navigating their environments with confidence and safety. It is a tool which allows blind people to travel where and when they want, and as such leads to self-sufficiency.